Favorite Line: You have honored the darkness. You have respected the ways of the Blood. You have always understood what the Blood were meant to be- caretakers and guardians. You have used teeth and claws when teeth and claws were needed. You have protected your young. The Darkness has sung to you, and you have followed roads few but the Dragons have walked. You have understood the Blood's heart, the Blood's soul. You have served well ... As she is the daughter of your soul, you are the son of mine. 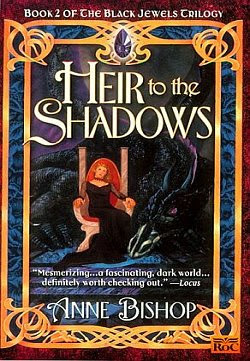 Anne Bishop plunged into dark fantasy with her first book, Daughter of the Blood. She described a world where Blood Witches have always ruled, drawing males to their courts through seductive power. An ambitious High Priestess destroys more powerful females before maturity and has enslaved the strongest males, weakening magic and corrupting natural bonds between men and women. Sexual violence permeates Terreille. Jaenelle, born to be Queen, is vulnerable until adulthood. Though guarded by male Warlord Princes, Jaenelle is violated. Daemon, her destined Consort, rescues her but is convinced he attacked her and goes mad. In Heir to the Shadows, Jaenelle's vampiric, adoptive father, Saetan, and her foster-family of demons shelter her. To restore her memory and emotional balance, they move to Kaeleer, where Jaenelle befriends the kindred--animals with magical and communicative powers--and gathers a circle of young Queens. She also heals Lucivar, Daemon's half-brother, who offers a brother's love and a warrior's fealty. As she recovers strength and memory, Jaenelle resolves to restore Daemon and cleanse Terreille. I really enjoyed this book! Usually the second book in a trilogy is the weakest, as it has the least action. The lack of action was certainly the case in this book, but I didn't find it weaker for that. Instead, Bishop takes the opportunity to build, stone by stone, a creeping sense of unease. Her characters grow into their parts, and we get to know Lucivar and Saetan and especially Jaenelle better than we did in the first book. The only negative? Hardly any Daemon, the hero of the first book. I also sometimes found the comic interludes to be a bit forced; this is a novel full of strong characters, and those personalities take up a lot of space, and clash with each other in very interesting ways. The comic scenes are fun and, more importantly, funny, but sometimes they seemed to jar with the story to me. That said, though, I liked every minute that I spent reading this book. January and February have been horribly slow months for me, reading-wise, with work and traveling and commuting really eating into my time. But this book grabbed my interest from the start and I am grateful to it for pulling me out of my reading rut. I was so intrigued, in fact, that I went out and immediately read the next one!